1. Muller JE. Circadian variation and triggering of acute coronary events. Am Heart J. 1999;137(4 pt 2):S1-S8. 2. Elliot WJ. Cyclic and circadian variations in cardiovascular events. Am J Hypertens. 2001;14(9 pt 2):291S-295S. 3. Gulyaeva N, Zaslavsky A, Lechner P, Chlenov M, Chait A, Zaslavsky B. RelaIve hydrophobicity and lipophilicity of betablockers and related compounds as measured by aqueous two-phase parIIoning, octanol-buffer parIIoning, and HPLC. Eur J Pharm. 2002;17(1-2):81-93. 4. Neil-Dwyer G, BartleF J, McAinsh J, Cruickshank JM. Beta-adrenoceptor blockers and the blood-brain barrier. Br J Clin Pharmacol. 1981;11(6):549-553. Offer not valid for any individual for whom any part of InnoPran XL® prescription is or will be covered by Medicaid, Medicare (including Medicare Advantage or Part D Prescription Plans), any state prescription drug programs, or any other public payer program. 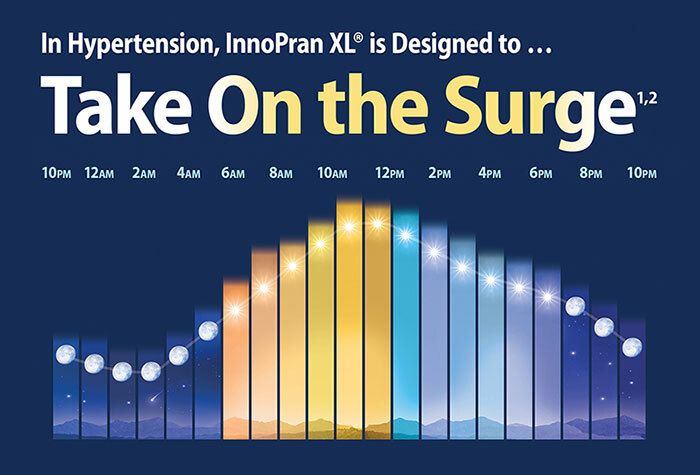 Offer applies to out-of-pocket (OOP) expenses for InnoPran XL®. Out-of-pocket expenses greater than $0 will be covered up to a maximum of $300 per prescription of actual out-of-pocket expenses (a) per 30-day supply for each of up to twelve (12) prescription fills, (b) per 60-day supply for each of up to six (6) prescription fills, or (c) per 90-day supply for each of up to four (4) prescription fills. To find a participating eVoucherRx™ pharmacy visit: www.evoucherrx.relayhealth.com/storelookup.